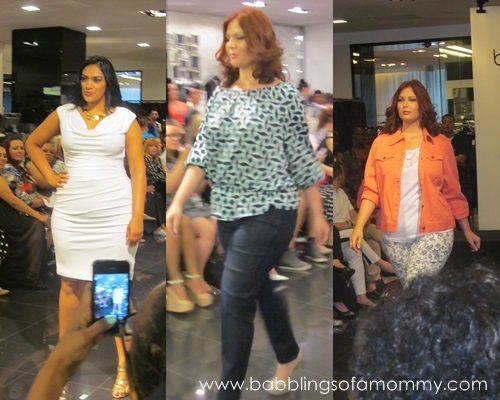 Among the events I attended at Full Figured Fashion Week was the Bloomingdale's runway show. 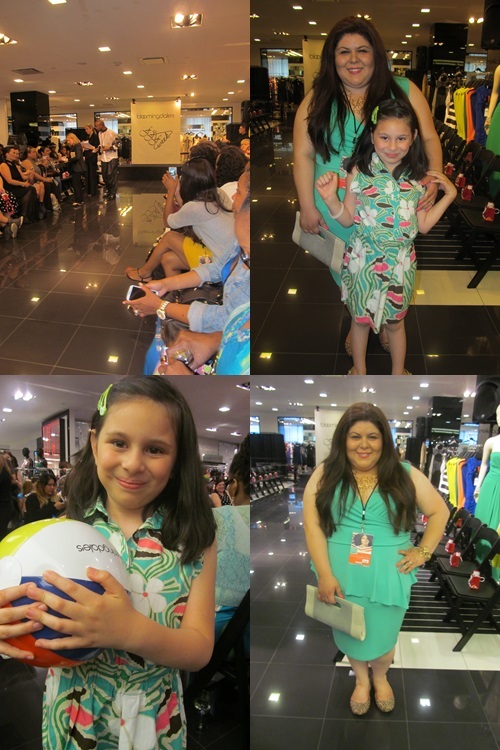 It was special event because I took my 7yr old daughter, Arianna, with me! She's been saying for a few years now that she wants to be a fashion designer, so I knew she would be thrilled to go to a real fashion show in the city! I could feel her excitement, and as a mother I was overjoyed for her. The show started off late which might have been due to the amount of people in attendance. From what I heard it was double the amount of people from last year. Arianna and I were lucky to have front row seats, but unfortunately a lot of people were left standing in the aisles. Bloomingdale's however did a good job of trying to keep the crowd entertained with white wine, hor d'oeuvres, and even tossing around a few beach balls - which of course my daughter made sure to get. Once the show started, designer garments from Michael Kors, Calvin Klein, Ralph Lauren, Elie Tahari, Jones New York, Eileen Fisher and more graced down the runway. The show was emceed by non other than FFFWeek creator Gwen DeVoe herself, and with style commentary provided by Meaghan from Little Lime Dress, as well as Corrinn Liche’t of The Fuller Figure and Steffany Allen of Steffy Full Style. 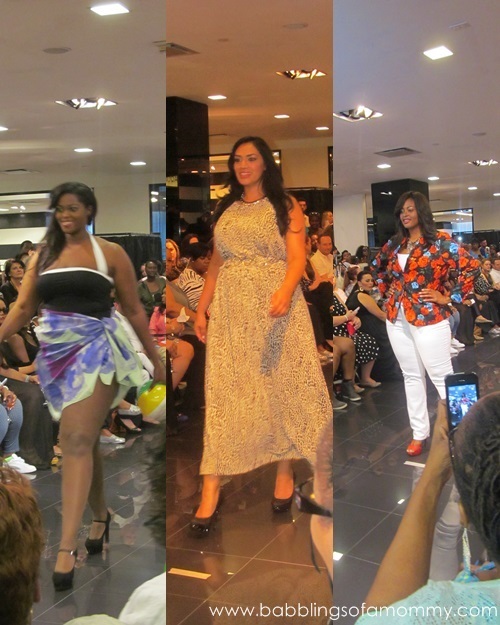 Overall, it was fun to see designer plus size brands strut down the runway. My favorite look of the night was a Michael Kors tunic and white jeans that was so "me". While Arianna was drawn to the dresses, including blue and white striped maxi dress, and a ruffled print dress. 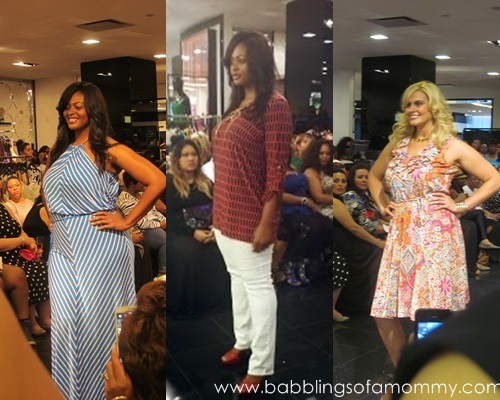 Take a look at some of the other looks that went down the runway and let me know which calls your name! Aww, I'll bet your daughter felt very special getting front row seats to a fashion show. That is so awesome! Love the styles too. Oh wow this looks like it was a great event! I'd love to be sitting front row with my daughters at a fashion show. You and your daughter look adorable, love the green dresses! Thank you for visiting me. Come back soon! How cute is she in that DVF dress??? how fun! And amazing you got to share it with your beautiful daughter!! !